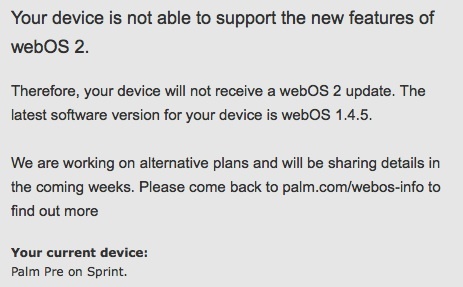 It has been almost four months since HP/Palm introduced the world to webOS 2, and there is still no love for Sprint Pre customers. Anyone who has purchased a Sprint Pre, either on launch day or afterword, was told by HP, then still Palm, that webOS 2 would be coming to all current webOS devices; the Pre 2 and earlier, which, we believed to also include the Pixi line of smartphones. After HP's acquision of Palm was completed, things changed a bit, and HP told Sprint Pre customers that a webOS 2 update was not coming as an OTA update and that in the coming weeks "alternate plans" would be made. No details have been shared yet. No updates have been released yet. No new webOS phones have been announced with availability on Sprint. To check your eligibility for a webOS 2 update or for details on HP's "alternate plans" for you, check out the HP webOS info page.